Contemporary blind-tooled calf over wooden boards, rebacked, clasps missing, manuscript leaf used as binding waste. 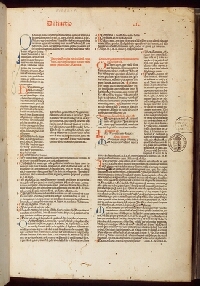 381 leaves; rubrics, running titles, and paraph marks in red; initials in red and blue throughout; printer's device in red on the final leaf; some contemporary notes supplying the text. 1. Stuttgart, Bibliotheca P.R. 2. Seiichiro Takahashi (高橋誠一郎).